An update is now available to the Drider avatar as the result of feedback accumulated over the past week! 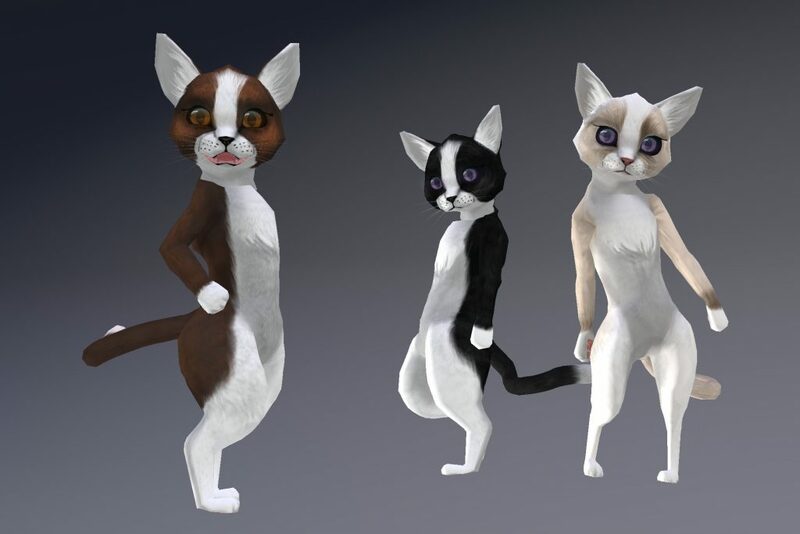 After a considerable amount of time spent testing various mesh body demos (both male and female), I was able to ascertain that the vast majority of mesh avatars fit the initial mesh body shape with minimal issue, assuming default male or female body shapes were used. A small number of mesh bodies did not fit this norm (or did not have sufficient alpha granularity). For these, a special version of the avatar mesh was made, featuring a wider and slightly deeper hip area. There have been additional resources added to the main documentation, including a full list of bodies tested, whether they are compatible and, if so, what the appropriate alpha settings would be. Additionally, after some feedback regarding attachment points, I was able to go back in to the avatar file and reposition a fair number of attachment points. Attachment points for the front legs should now all match up to their appropriate bones. Wing attachment points now match up with the second set of legs (lowest joint). Hind attachment points now match up with the third set of legs (lowest joint). Tail base and Tail tip were found to not be movable, so tail base fits the top of the right hind leg and tail tip moves to the top of the left hind leg. Additional testing involved the most ideal attachment point for adding things to the abdomen – For this purpose, I recommend Pelvis. Spine is affected by the position of the torso, groin doesn’t play well with the bones being used for the spider thorax & abdomen. Please note: One attachment point will give you up to five attachment slots to use at that one point. To use multiple attachments per point, simply ‘add’ instead of ‘wear’. All vendors and marketplace listings have since been updated – to check if your package is up to date, please check the description field of your avatar’s box. If it predates 2017/10/21, please exchange your avatar at the Wilds of Organica Avatar Exchanger, which is currently located here (but which you can always find a SLURL for in Aki Shichiroji’s profile (under Picks> Gacha Exchange Policy and exchanger location). Lastly – there have been some inquiries about a dev kit for the drider avatar. There are plans for this, but it is not available at this time. Interested parties should keep an eye on this blog, join the in-world group or the Discord server for announcements regarding applications and availability. As I mentioned in a previous post, the Centaur avatar has been awaiting some pretty major updates as the new applier system has been in development. The system wasn’t quite ready for prime time when they were first released, but over the past week or so we’ve had the opportunity to buckle down on all the necessary functionality and to offer additional coats while we’re at it. 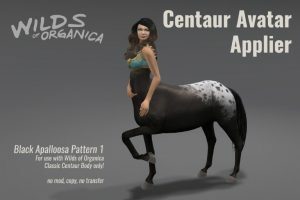 So let’s start off with the major changes – The new applier system shall allow third parties to easily & quickly offer new textures for the centaur body without having to worry about potential issues giving textures away. To use the new appliers, all you’ll need to do is either wear or rez the applier in a script-enabled area (while wearing your avatar body) then click to apply. Once all aspects of the applier have been sent to your centaur body, the applier can either be detached or deleted. What does that mean for people who’ve already bought the avatar? 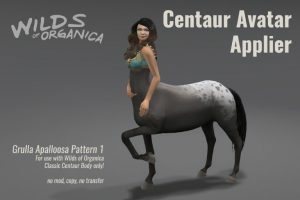 Moving forward, the Bay coat will be the default coat that comes with the centaur body. All other coats will be made available separately using the new applier system. These packages will each include both one copy of the mesh body AND a copy of the appropriate applier. Cool, but what happens to those people who bought multiple coats? Each existing avatar holder is eligible to update their avatar and receive the appropriate applier via the exchange process. (Yes, even RFL edition avatar holders!) Additionally, appropriate refunds for the difference in cost between full body & applier shall be handled individually upon request (please be patient as there may be a sizable queue). How do I create for this avatar? Last but not least, here are four new coats offered as appliers! 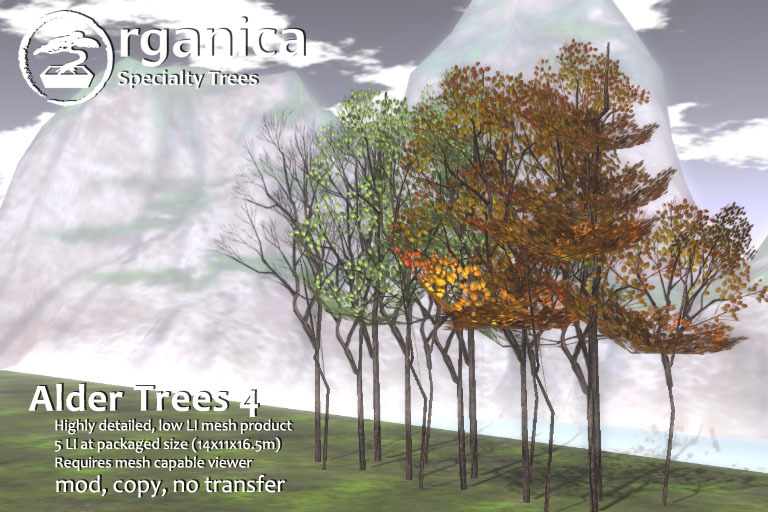 An issue was found and fixed regarding the scripted foliage for Alder Tree 4. If you purchased a mod/copy version of the product, you should already have received an update package. For those of you who purchased mod/transfer versions prior to today (02/05/2014), you can have the scripted item updated by sending me the scripted version you got in a folder labelled with your name. I should be able to handle the switch for you within 24hrs of sending unless otherwise noted in my profile. If I’m online (I never hide online status on my profile), you can also just send the tree to me directly and send me an IM. All deliveries moving forward, whether from store or from Marketplace, should include this fix. A bug was reported and fixed earlier today, relating to the eye control portion of the Sugar Glider HUD, where the pupils resized to the wrong scale and proportion. This has been fixed with v1.01. Check the description field of the package. If the field is BLANK: You must LOCK IN at least one avatar to get the updated HUD. Instructions for how to do so can be found in the notecard inside the package. 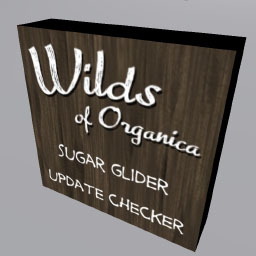 If you have already locked your av choice in, please TP to the Wilds of Organica shop and rez your updater prim. Please be patient – it takes a little while for the update server to check for your update. If you did not receive your update, please let me know and I will process your redelivery manually as soon as possible. These items have also been updated in-world. Marketplace listings for these items are currently offline and will be updated once some issues with Direct Delivery have been addressed. Your Recommended Daily Intake of Veggies! + Discount and Land news. Another busy month has kept me from putting out as much content as I’d prefer, but I’m pleased to announce the following items, which have been made possible in part by the recent rollout of mesh to SL. 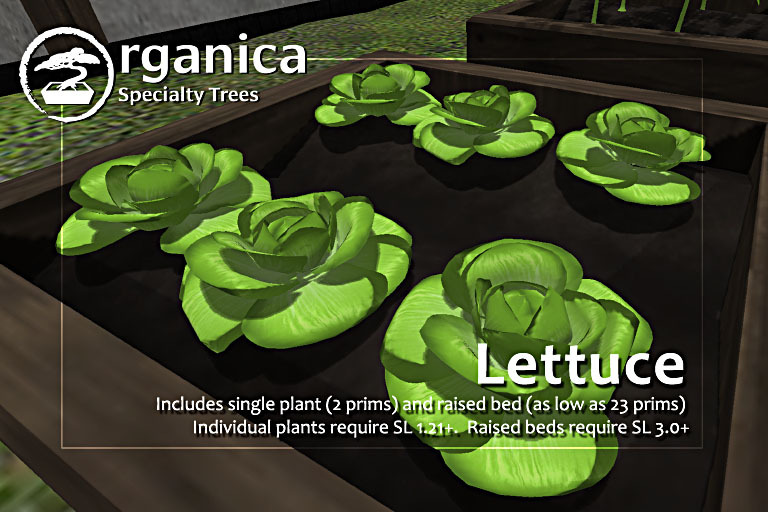 This two-prim veggie is available as an oblong sculpt, so you should be able to view it if you use a SL viewer based on 1.21 or later. The product also comes with a raised vegetable bed, which is mesh. You’ll need Viewer 3.0 or newer to view that. These plants feature sculpted foliage, stem and fruit. 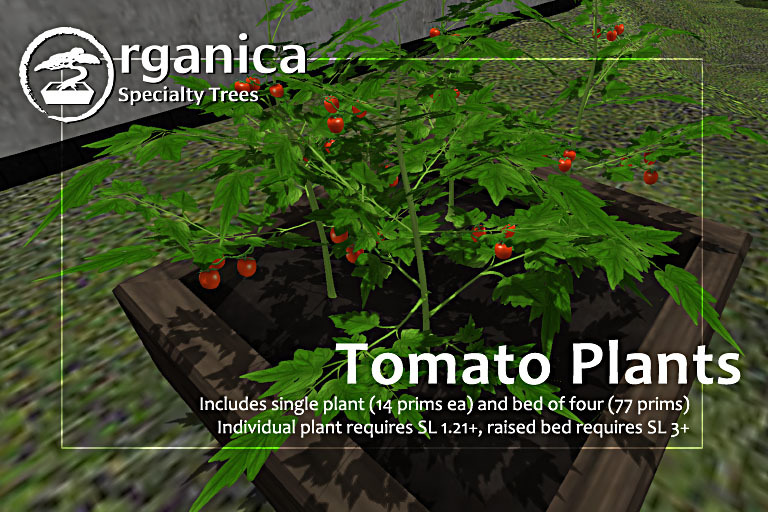 Individual plants come to 14 prims each and a full raised bed is offered at 77 prims total. 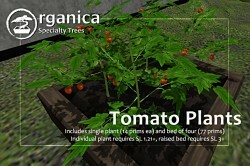 The raised bed is mesh, so you’ll need Viewer 3.0 or newer to view it. 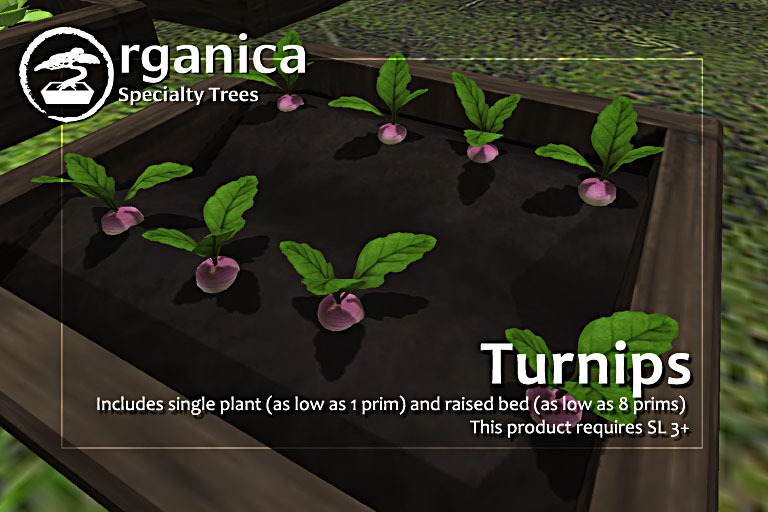 These turnips (with raised bed) are completely mesh; you’ll need Viewer 3.0 or newer to view them. Individually they’re one prim each. 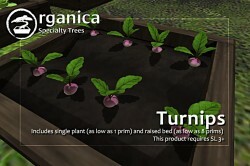 Raised beds are 9 prims. All of these items are offered mod/copy. Once this collection of vegetables hits 8 products, a fat-pack will be made available. Please hang on to your transaction records for a refund (for the difference) later if you pick up all eight. As part of the recent mesh update, it is now possible for all 3.0+ viewers to resize objects up to 64x64m in size. As such, selected items in the store have been discounted to reflect that change. As a one time deal, if you purchased any one of the following items within the past 30 days, you are eligible for a refund for the difference. Please send me a notecard containing the number for the transaction and I will process your refund as soon as possible. One parcel of land is now once again available in Sylvan sim, which sits adjacent to Organica. If you enjoy alpine/lakeside environments and a healthy primcount, this parcel may be just the spot you’re looking for. The parcel holds 2944sqm of land and supports up to 673 prims. Situated in the north-eastern corner of Sylvan, residents can access the handy Sylvan Sandbox at any time in the south-western corner of the sim. If a bit of quiet is what you’d prefer, this parcel is surrounded on three sides by water and is an excellent spot for your home. I can’t go in to it in too much detail just yet as I have not confirmed, but limited additional land may also be made available within the next few months. I’ve yet to solidify actual parcel sizes however your input on what you are looking for would be of great help. Feel free to give me a shout in-world (notecard Aki Shichiroji).